Razzle-dazzle your guests with this yummy showstopper dessert! Serve this for a holiday or a special occasion. A wonderful dessert to serve at your Memorial Day picnic or barbeque when rhubarb can be found fresh at your supermarket. 1. Mix rhubarb, sugar and orange juice in 2-quart saucepan. Heat to boiling over medium heat; reduce heat to low. Cook about 15 minutes, stirring occasionally, until rhubarb is tender and mixture starts to thicken slightly. Cool 30 minutes. Refrigerate about 2 hours or until chilled. Stir in sliced strawberries. 2. While rhubarb mixture is cooling, mix pudding mix and milk in 2-quart saucepan. Cook over medium heat 6 to 7 minutes, stirring constantly, until mixture boils. Cool 15 minutes. Refrigerate at least 2 hours until chilled. Fold in whipped topping (or whipped cream, if using). 3. Cut pound cake horizontally in half. Spread marmalade over bottom half. Top with top half. Cut into 18 slices. Place 9 slices in bottom of 2 1/2- to 3-quart trifle or serving bowl. 4. Spoon half of the rhubarb mixture over cake; top with half of the pudding. Repeat layers with remaining cake, rhubarb mixture and pudding. Cover and refrigerate at least 2 hours until chilled. 5. 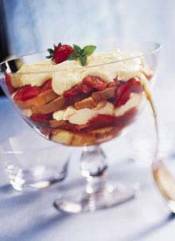 Arrange whole strawberries on top of trifle. Garnish with orange peel. Store covered in refrigerator. *Note: Whipped cream can be substituted, if desired, for the non-dairy whipped topping. Beat 1 cup whipping (heavy) cream and 3 tablespoons granulated or powdered sugar in a chilled medium bowl with an electric mixer on high speed until stiff.